05th July 2012, second day on the ride and I was rudely awoken at 06:30 by my alarm telling me it was time to get up and consume breakfast. This time in the morning is never good for me, I had a bit of a restless night and I knew that I had at least another six hours in the saddle that day. My room mate (Gael) woke up too and we discussed briefly about arriving early for breakfast to avoid the mad rush as the other 90 or so cyclists came down for breakfast. I’m not a huge breakfast person, I try my hardest to keep myself to 3 meals a day which includes breakfast but I’m not actually hungry that early in the morning, however I knew that I had to eat to get the energy I needed for the day. Breakfast consisted of muesli, french bread and cheese, fruit, yogurt and in fact anything I could lay my hands on carb and calorie loading for the journey ahead. By 08:00 most of us were outside and ready to go. Today’s stint was from Calais to Arras a rough 120km and by the look of the topography we had a few nasty looking hills to deal with. My legs and body in general were tired which was caused from a mixture of lack of sleep from the night before, getting up early that day and physical exertion. I estimated that we had a short 30 or so kilometres to the first stop then lunch was around 78 km and the final stop before the approach to Arras at 115 km. You might be able to see from the topography things started out quite flat and smooth from Calais and then we hit the first hill just before the first water stop. It was here I met up with quite a few other riders, you could see how tired people were and we all knew this was just the beginning. From here we cruised through the forest and then started to go through some small towns, in the small town of Quercamps at around 34km I missed one of the turnings and cycled all the way to the next town and back before I met with another rider (also called Chris) found me and together we backtracked. It was very good to be riding with someone through this bit, Chris was a much slower rider than me but I did not mind waiting for him as the French authorities had removed our orange arrows for the next few towns. This made the going incredibly slow and time consuming not because of Chris’ speed but just the fact we had to keep checking the map etc. It was a good thing that before we left the UK Macmillan and Discover Adventure had issued us with maps so we could just go from one town to the next until our orange arrows re-appeared. Eventually around the town of Dohem the orange arrows re-appeared and I said my farewell to Chris as I pushed on towards lunch. 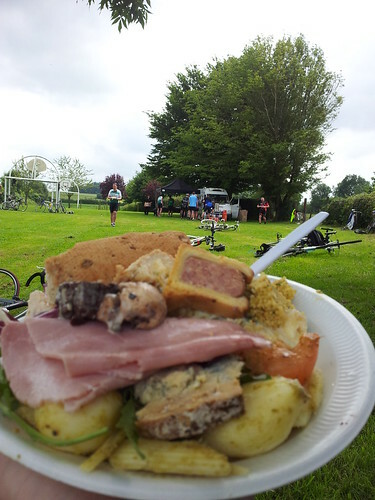 Lunch happened and was very appreciated around 73km into the ride. I was very tired and wanted just to stop for quite a while to let my body rest before taking the next bit. Although today had been a struggle up until now I was glad to know that I was over half way and the next stop was not as far and from there it would be easy. Some people I overtook caught up and I sat and ate taking my time to eat slowly so my body can absorb something before heading off again. Lunch. #LondonToParis About 80km in. So many hills both up and down, sun is out. Feeling okay. The final stop could not come soon enough and around 103km in it arrived by this time I was promising myself a beer, an early night and the fact that I was not going to cycle until the next morning felt like bliss. My body also knew that from the last stop it was very easy going and after a day of what felt like horrible hills my legs were thankful. Arriving in Arras to a cheer from some of the other riders I put my bike into the hotel and went for a well needed shower and then dinner. Motto for the day was “hills hurt” but looking back I know that this day was less hilly than Kent but I think the extent of the first day compacted with the second made it feel just that much harder.